Saturday was a day of transition for me. I stayed at a casino parking lot last night in Scottsdale after getting Brianna to her red eye flight at 10:30 pm & then filing an online police report, finishing at 11:30 pm. Our week together left me with a loss of companionship today having spent day and night with her for just shy of a week and now being by myself. I was up and out of the casino parking lot about 6:30 am and on my way to McDonalds for some bandwidth for my phone and IPad having not been able to sync both for a few days. Boy there are a lot of application updates that need to be managed. While waiting for downloads I collected my thoughts and decided to go to a couple of "Swap Meets", what we would call group yard sales looking for a used replacement bike. I had seen two of these swap meets near each other in eastern Mesa when with Brianna yesterday tracking down mexican food for her to bring home to Oma. (Oma is Denise's mother/Brianna's grandmother, who is of Mexican heritage. I went to both swap meets and saw one bike that was older than my bike for $98. It was rubbish material and I decided that I would need to look at Walmart had to offer new later in the day. I had arranged a date for lunch today the week before and was looking forward to it. Darlene Boucher was in charge if Personnel at the Town Hall where we worked together in Westminster, and had moved to Gilbert, AZ last fall. I looked forward to our meeting as it would be nice to sit and talk with her. Darlene is a quiet polite and easy to talk to. She looked well having not seen her in 5 months. We met at where she is staying and searched out a a very nice grill near her house that she haven't been to before. The food was surprisingly very good and we sat outside, both of us enjoying the AZ warmth. We caught up with what has been going on in our lives. She works in Tempe in personnel for a company where she is a temp for 6 months before any decision of hire. I hope the job works out for her as it will provide security and an opportunity to settle into a place of her own in the future. Her family lives in the Greater Phoenix Valley area so it is nice for her to spend time with them that she could not do living in New England. We said goodbye and I moved on to a park do I could do the dreaded taxes. 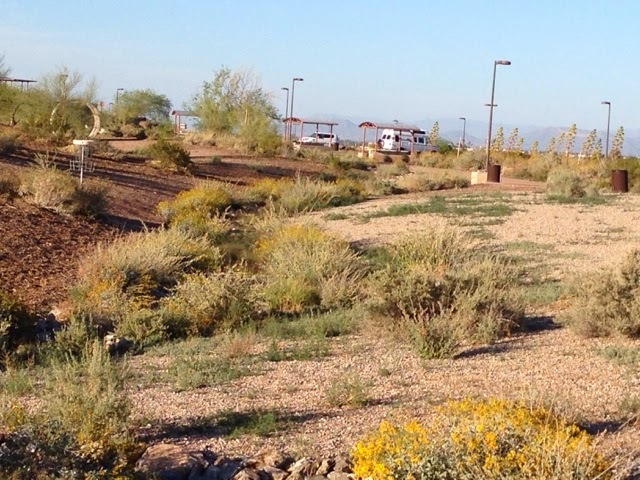 The first park I found was so crowded there was no place to park, so I went to the park in Chandler where I had played disc golf before. On a hill there was a nice breeze for this very warm day. I was going to sit at a picnic table with cover but the glair was too bright for the laptop screen to be seen. Plus I could see this was going to take time and would need power for both my phone and laptop. At this time I thought I hadn't taken one photo all day for the blog. Sorry folks! Will need to get with the plan tomorrow. I guess my thoughts were elsewhere. I texted Brianna to tell her I missed her being with me and got started finishing the taxes. I had started both Federal and State Taxes before and worked on them as Denise sent me information. I needed alone time to finish them as Denise had done her job and it was now time for me to just do it. Being a transition day and having alone time it was now. I also had the reward that if I finish in time I can play a round of disc golf before dark. I turned on the phone's WIFI hotspot and got down to doing the taxes linking the laptop to the WIFI I created. So many questions! I had to retrieve electronic pins for both Drnise and me from the IRS to electronically file. So many steps to filing. Finally, I am ready to file and the software says you need to do an update of the Turbo Tax software before filing. Yet another hurdle. 15 minutes later I finally get the software updated and I can file. Success! 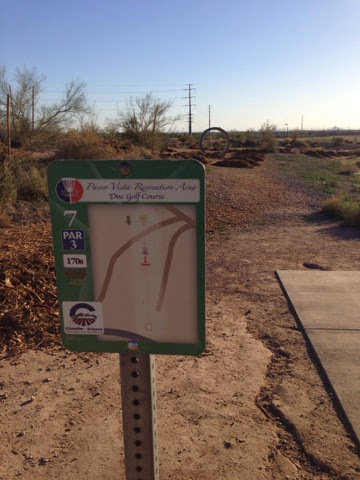 Both State and Federal were accepted after 2 hours and I had time for disc golf before sunset too. I love this course. So great signage & basic design yet with enough challenges to make me feel frustrated at times. I stayed here until dusk and then went for the "two fur". That means I got 2 for one stop. Walmart Super center & it had a McDonalds inside. Shopping for some food for the next few days and some more bandwidth. Yes I am a bandwidth hog as I need to feed my need for data without going over my AT&T 5 gig data plan. Podcasts are great and provide entertainment and diversion but they take data download bandwidth. It was now 8:30 pm and time to decide on my next place to stay. I decide to stay at another casino in the area.